Laura Holcombe | Resource Financial Planning, Inc.
Laura was born in Alaska, but has planted her roots here in Oregon. 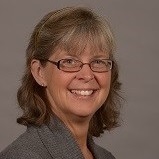 As a third generation graduate of Oregon State University she has worked in the financial services areas since 1985. Laura is a Certified Financial Planner® and holds a Series 7 securities registration. She also holds a Series 66 Investment Advisory Representative registration, as well as life, health and variable insurance licenses. On top of being a financial advisor, Laura is committed to bettering the community by spreading the word of financial responsibility to young and old. She honed her speaking skills at the local Toastmasters International, and along with the other advisors at Resource, Laura teaches classes throughout the year at Portland Community College as an adjunct faculty member as well as at local businesses. She also volunteers her time to offer financial education classes to the community. Being a financial advisor is not just Laura's job; after spending any time with her you will realize it is her passion. She is dedicated to setting goals for people who have a desire to better their financial situation, and as ever the optimist, you will always feel supported under her guidance. Commitment to client service is the foundation of her business. A naturally warm, caring and enthusiastic approach shows her dedication and appreciation for her clients – and may just get you one of her delicious homemade pies! With her husband Rob and their two grown children, Laura enjoys going on family trips and spending time enjoying the sunshine. Laura has been an active participant in her children's lives but as they move on to their own endeavors, she spends most of her time hiking, biking, backpacking, and taking their RV and boat out and about!